Campus visitation for Spring 2019 semester is now open! Additional dates and times will be added periodically throughout the semester, so please check back on our Events Page for updates. Our Campus Visitation Program is available throughout the academic year. Spend a day (or just a couple hours, if time is tight) at Haas, experiencing life as a Berkeley MBA student. When registering, you will be asked to select a preferred class to visit. We typically offer morning (9am–11am), afternoon (2pm–4pm), and evening (4pm–6pm) options. Spaces fill up quickly, so register early for more options. If class visits are full on the day you're coming to campus, you're still welcome to participate in the activities listed above. 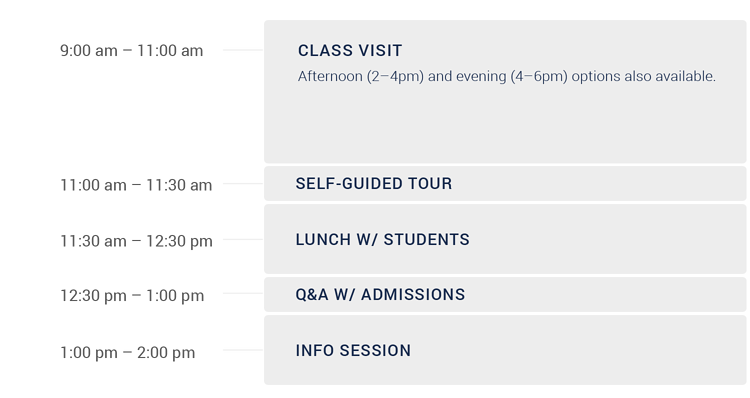 Just select the "No Class Visit" option when registering. Here's what your day might look like when you come to visit. Visitors may take advantage of drop-in advising with an admissions or financial aid representative Monday through Friday, from 9:00 AM to 4:00 PM.